Taking the lift to the dome of the large converted water tower, we entered the darkened viewing room of the camera obscura. When the aperture 10m above us was opened, light was reflected off a 300mm mirror that could be rotated at the top of the dome, through a set of lenses with an aperture of about 140mm and projected to give an incredibly realistic view of the surroundings on a wide table. In the weak winter sun, the scene was not as bright as at noon on a full summer's day, but when the mirror was rotated to view the nearby roads, the cars and buses seemed to be toys within touching distance. Fortunately, I was armed with camera and tripod and was able to take a series of images, not just of the projections, but also of the amazed and interested spectators. Their faces glowed in the reflected light. The winter sun was setting and over a period of half an hour came into projected view. We first followed it with a small screen until it reached the main projection table. Here, glowing in it's full glory, the disc of around 8cm diameter clearly showed two sunspots. Shining through the lower bands of the atmosphere, the disc also rippled with slight atmospheric disturbances, as if it were alive. The principle of the camera obscura was known to Aristotle. As children we came across the portable version, the pinhole camera. David Hockney recently gave an excellent TV series on how Renaissance artists probably used the method for their incredible perspective and realistic paintings. However, large scale projections still have their own magic when you encounter them. Coming down through the museum, we found the photographer Michael Schaaf (www.colloidon.de) preparing for a workshop with an old plate camera,using the wet colloidon principle. I picked up a very useful tip here: Use long exposures to photograph a portrait and you avoid the bane of any photographer's life, people blinking just as you take the picture. With a longer exposure ( a couple of seconds) blinking does not register. But your subject has to remain very still! Ulrich Heker is himself an accomplished photographer (and has done nearly all the photos for the articles I translated for various dental magazines). So we naturally had an extended conversation with Michael Schaaf, which tested the patience of our companions. 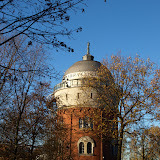 If you are ever near Mülheim in Germany, make a point of visiting the Camera Obscura there. Other exmples worldwide can be found by following the links here http://www.camera-obscura-muelheim.de/cms/camera_obscura_weltweit1.html.